Have you ever tried to lose weight and struggled, or even failed? 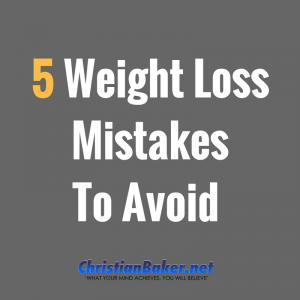 Coming up in this video I’m going to share with you 5 Big Weight Loss Mistakes many people make, that prevent them from losing weight and feeling great. Have you ever tried to lose weight and struggled, then you’re not alone. I’ve worked with so many clients over the years that have tried to lose weight and they’ve struggled for many different reasons, so today I’m going to share with you the 5 Big mistakes that many people make that prevent them from losing weight and feeling great and once you know them, then you can avoid them. The Number 1 mistake is Dieting, you need to ditch the diet. The biggest mistake most people is going on a diet, diets don’t work, fad diets aren’t usually sustainable and that’s why there’s so many of them. Diets are an eating plan, and if you need that structure and guidance then a sensible eating plan can be very effective. But from the perspective of your mindset, just the word diet, triggers of feelings of deprivation and sacrifice as most diets tell you can have something and when you’re told you can’t have something, it often makes you want it even more and the more you mind is looking out for it. So, this combined with past failed attempts to lose weight, often means the mind has negative associations with going on a diet, making it difficult before you even get started. By all means, get an eating plan, but ditch the diet, let go of dieting for good and simply change your mind and adopt a healthier relationship with food, drink, exercise and yourself. Mistake number 2 is ignoring your eating habits. Think about your own eating habits, think about things like your portion control, be aware of how much food you put on your plate in the first place and learn to give yourself that create the habit that it’s ok to leave food on your plate and you don’t have to eat everything that is put in front of you. The other eating habit to consider is the speed you eat, learn to slow down and take your time. Most people because they are bust in life, they’re eating on the go, they’re eating while they’re working. Instead slow down, take your time and give your mind and your body a chance to work together and allow yourself the chance to tune into the body’s nature signals that let you know when you’re comfortable satisfied and when you need to re-fuel. Part of slowing down is also to chew your food thoroughly, remember that your tummy doesn’t have teeth and proper digestion begins in your mouth. So, get into the good eating habit of taking your time, slow down and chew your food more thoroughly. Mistake Number 3 is Inactivity. The 3rd Big mistake most people make is lack of activity, I know it’s common sense that you need to move your body more, but often people don’t do enough of it, or certainly they’re not consistent with it. So, if you’re looking to lose weight and feel great, think about how you can increase activity in your life. Notice I didn’t say exercise, the word exercise is like the word diet, it often creates resistance, it has negative connotations, triggering negative memories and feelings, instead think about the many different ways you can move your body and be more active in your life. So just be more active, feel better and that will naturally spur you on to lose weight and feel great more effectively. Mistake Number 4 is making it all about the food, and yes, the food you put into your mouth is important. But as I’ve just said in number 3 you also must look at your activity levels. It’s also important to pay attention to your fluid intake, the drinks you do or don’t consume. Maybe you could benefit from drinking more water, as often the clients I see don’t drink enough. We’re made up of around 60% water, so it’s important we keep hydrated. And often hunger is confused with dehydration, people are often dehydrated when they think they are hungry, so they eat more, when really, they should have drank sooner and kept themselves hydrated. So, if you feel hungry the best thing to do, is to have a glass of water, give yourself 15-20mins and if you’re still hungry, then find yourself something suitable to eat. Also, it’s important to consider one’s alcohol consumption, as part of your fluid intake. The times I’ve seen clients who go to the gym, they eat healthily, but yet they still struggle to lose weight and when you have a deeper conversation with them, they often realise, or admit that they have a glass or 2, or even a bottle of wine, their meal and during their evening and they’ve just got into some bad drinking habits, which doesn’t serve their target to lose weight. And when you add that up over a day, a week or even a month, that’s a lot of empty calories. So maybe it’s time to make some adjustments to your fluid intake, reduce the intake of alcohol and see how see how you can drink more water to help you lose weight and feel great. Mistake 5 – Ignoring youre mindset. Another big mistake that most people make is overlooking their mindset. Your mindset being your thoughts, your feelings, your habits, behaviours and associations around food. Often people eat for emotional reasons, not because they are naturally hungry, it could be for positive or negative reason, maybe boredom, frustration, loneliness, stress, reward, happiness, to celebrate. So, think about your habits, your conditioning your programming around food and take your mindset back towards to seeing food for what it really is, simply a fuel for your and your body and when you do that it helps to eliminate any unnecessary eating. If you need any help with making some changes to help you re-programme your mindset around food, then get it touch or download my weight loss audio to help you lose weight and feel great. So they go, there’s the 5 Big Mistake I’ve discovered from working with countless clients over the years, now you are aware of them, you can avoid them to help you lose weight and feel great. Thanks for watching and if you found this video helpful, Please click subscribe and subscribe to my channel to get all future episodes.